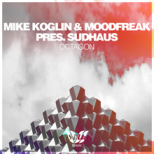 The Sudhaus pairing deals out another pristine example of pumping melodic progressive, drawing brazenly on the classic progressive sound in its most peak-time-focused form. It’s a deft mix of thundering basslines, trancey flourishes and overblown build-ups, glossed over beautifully with a futuristic sheen. Sudhaus have locked onto a classic, overlooked club aesthetic, and polished it with a 2.0 upgrade. The driving ‘Dusk’ on the B-side is just as good.